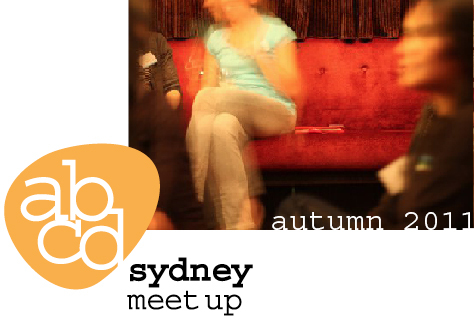 Our previous abcd Sydney meetup was such a great success, so we're having another one in 3 weeks time. If you blog about art, craft or design and would like to have a casual drink and chat with other like minded souls please join us! We want to encourage people to get out from behind their computers and turn online into real life. Share a drink. Make a friend or two. Be inspired. It's all very relaxed and dimly lit (!) and lots of fun. We have abcd meetup goodie bags at the event, which you can contribute to if you wish. Last time they were chock full of handmade goodies and sweet mementos - little somethings to remember people by after the event. If you're coming along and would like to be a part of the goodie bag giveaway (only those who participate will receive goodie bags) then let us know in your RSVP. Then we'll be in touch about a week before the meetup to let you know how many goodie bags we'll need to fill. Something new this time will be a noticeboard - we'll provide tags and pegs so you can put up notes and information to share with everyone. You might like to share resources, wanted ads, tips, or any info you'd like to share with our little community (but not blatant self promo please). After the event we will email all the info collected to those who attended on the night. So start collecting little tidbits now. We'd love to see you again, or to meet you for the first time... we're not a scary bunch, promise!